It rained during the night and in the morning. We woke very early and used the small kitchen to make breakfast and pack our things. It was cool and raining moderately as we set off for the day. The ride out of Neuburg was a straight run on the bike path along the side of the road. 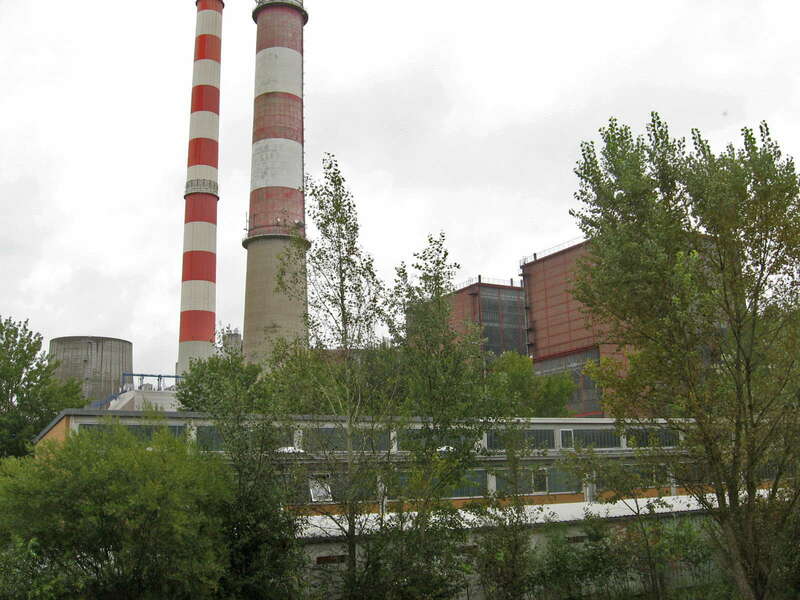 It follows the edge of the Englischer Garten and the town forest, runs past an industrial area and bends around Grünau. We rode through fields and forests to Weichering and then again through fields and forests till we approached the river again at Haunwöhr. We made very good time despite the rain because much of the riding was on straight paths. We had decided not to follow the official path across the river but to stay on the right bank as there seemed to be a small road which ran alongside it, bypassing Ingolstadt. This was a good move as it was through parkland most of the way. We also saved a lot of time with this detour. We saw an amazing bridge at one point and buildings from the old town as we passed. On the other side of the town we crossed the river and picked up the cycleway on the left bank. 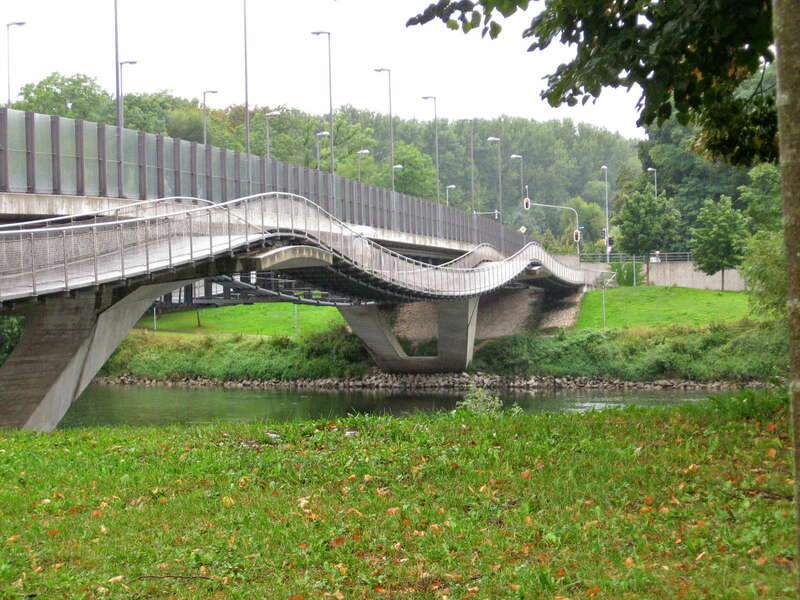 This bridge has the type of pedestrian/cyclist path that I have also seen in the south of France at Les Eyzies. I think the waves in the construction are something to do with the way the bridge is built, and the supports available for the pathway. They seem to be suspended on wire, which accounts for the catenary shape. They are weird to cycle over! The towers of the Neues Schloss of Ingolstadt appeared across the river. We kept going. The Neues Schloss in Ingolstadt is one of the most important Gothic secular buildings of the 15th Century in Bavaria. The builders were Louis VII, Duke of Bavaria-Ingolstadt and Duke George the Rich of Bavaria-Landshut. 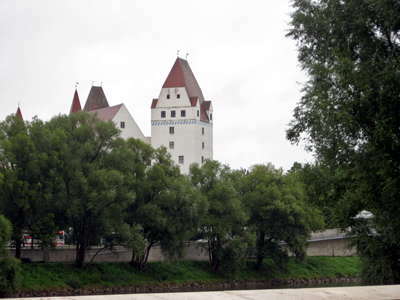 The neighboring Old Castle, a medieval fortress from the 13th Century, is today called Herzogkasten. As a brother of the French queen Isabeau, Ludwig spent more than ten years in France. After returning to his home city of Ingolstadt, he could draw on abundant finances and in 1418 gave the order to build the new castle following French models. 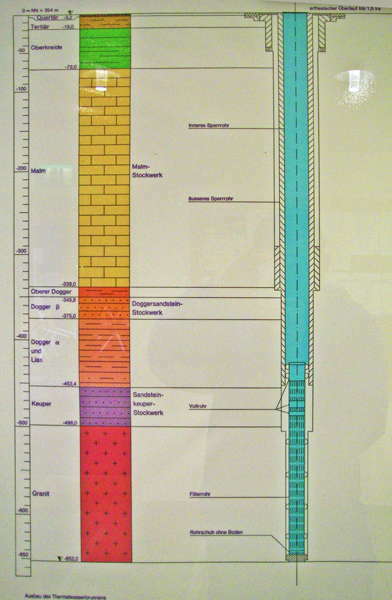 By his death only the foundations had been built. The present structure was built largely on the old foundation until 1489 under the Landshut dukes, as evidenced by the surviving detailed invoices. Towards Großmehring we stayed on the left river bank following the green Radweg on the levee bank rather than taking the Donau Radweg through the town. 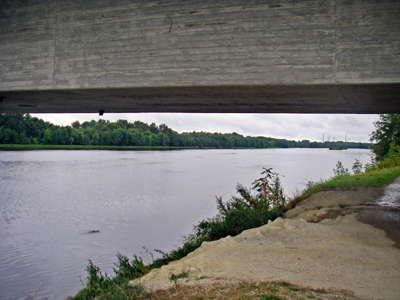 There were some very strange crossings here with paved sections going down to the water, as though the river was used for military crossings. We couldn't work it out. I was getting quite cold so I found my arm warmers on one of our stops. 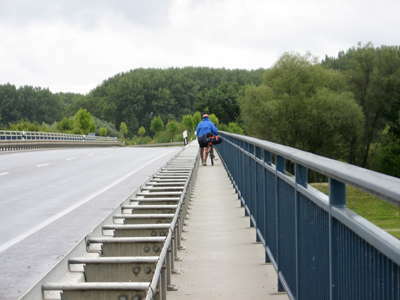 We then crossed the river over a bridge and picked up the cycleway on the right bank again riding past Vohburg and crossing the river again to the left bank. We somehow managed to lose the track in Pförring and ended up doing a 10 km loop back to Wackerstein. This was very frustrating as it was cold and wet and we needed to get shelter. I asked for directions when we reached Pförring again and this time we found the right exit. This was a very odd part of the river. It seemed to me to be a broad road put in for defence purposes, where amphibious vehicles, or those with large wheels, could cross quickly, or a pontoon bridge could be put across the river in time of need. The Radweg takes you to some out of the way places, and we sometimes felt we had to duck our heads when travelling beneath the approaches to bridges. An industrial area across the river. 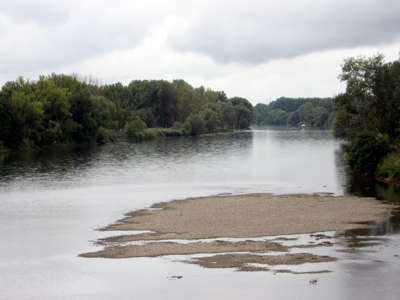 The Kleines Donautor (Small Danube Gate) in Vohburg an der Donau. 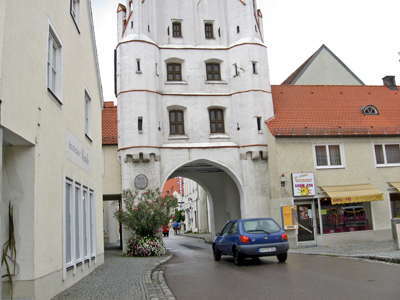 This gate (1471) forms the southern entrance to the town square. The two-story, stuccoed building is of late Gothic form. We crossed the Donau again and went through Pförring on the left bank. 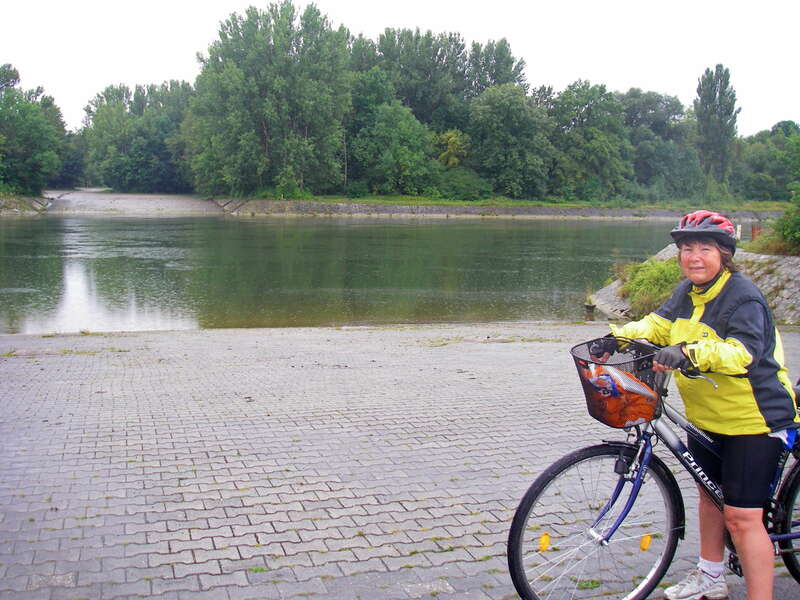 Once again we rode through open country and crossed to the right bank to make our approach into Neustadt an der Donau. 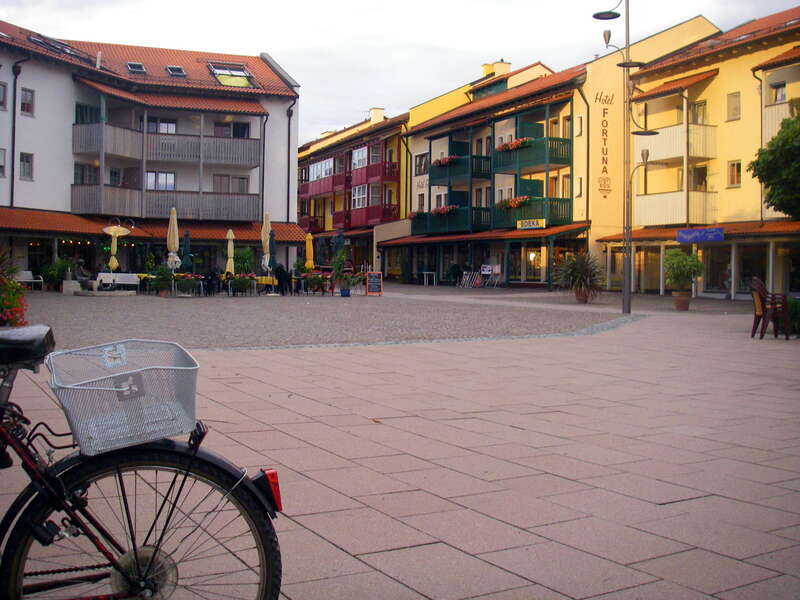 The cyclepath skirts the edge of the town and we pushed on to Bad Gögging where we hoped to get a room for the night. The space for pedestrians and cyclists was quite narrow, so we had to dismount to cross the bridge. 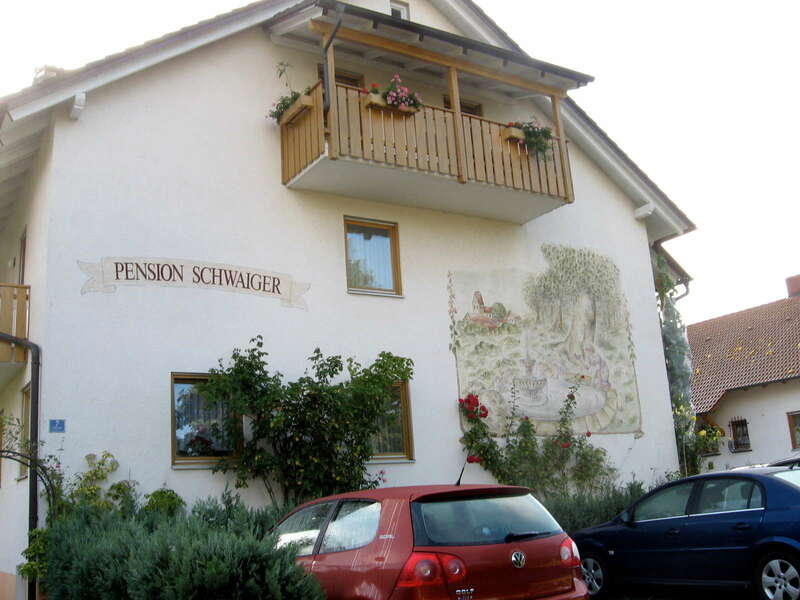 As we rode towards Bad Gögging, we saw some signs pointing to pensions and knocked on the door of Pension Schwaiger hoping to get a room. We were in luck. Not only that but it was superb and only cost 48 Euros. Bad Gögging is a spa town with some very pricey accommodation. Normally you would have to book months ahead to get a room but it was the start of autumn and getting quiet. 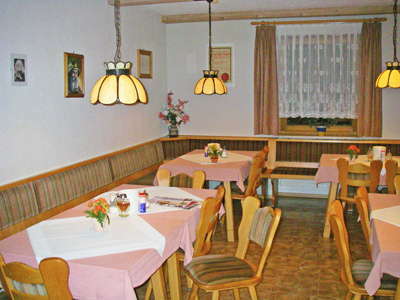 The room was excellent and there was a kitchen and dining room down the hall. 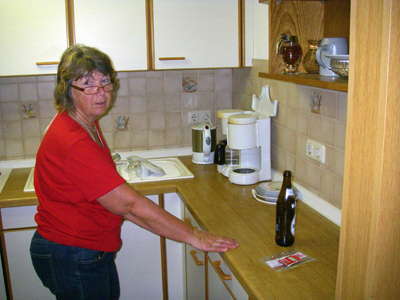 They sold beer and soft drinks as well. We showered and had an afternoon nap. It was so nice to be warm and dry again. The rain had eased by the early evening so we walked to the spa itself to have a look around. 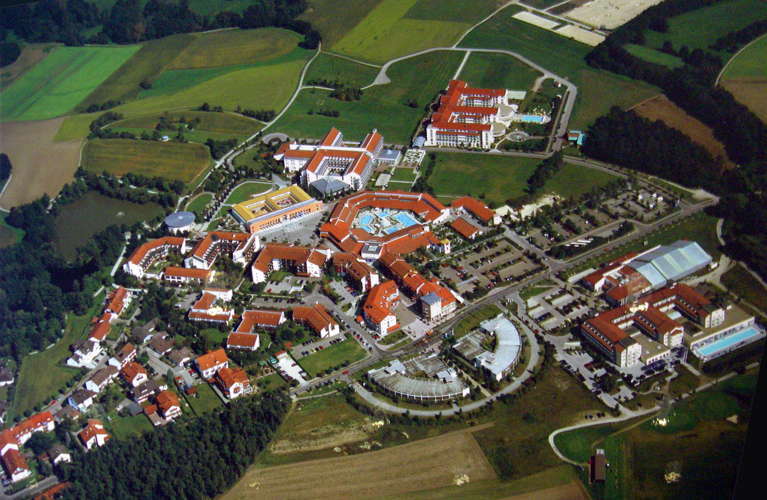 It is an amazing complex with several pools and a whole health/wellness industry. 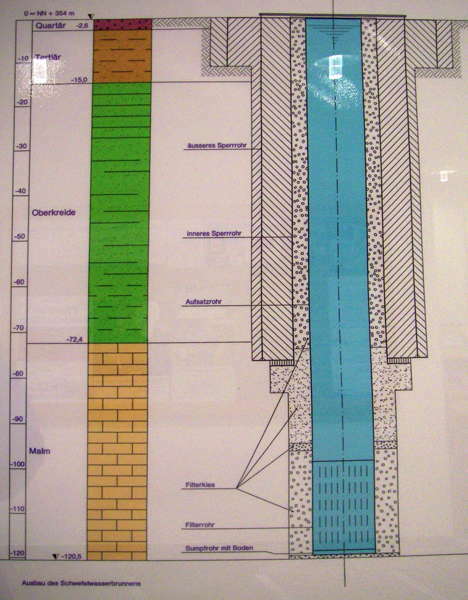 There were wall charts about the wells and even an aerial view of the place. 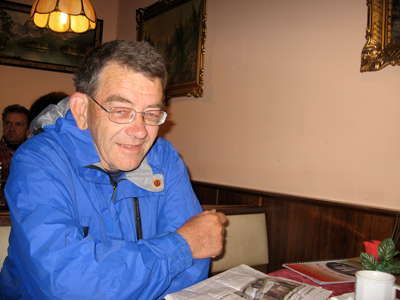 After looking around we had a coffee and cake at one of the cafes. We still had some food left over so decided to eat that for the evening meal. This was the main commercial part of Bad Gögging, a town which caters for tourists who come to soak in the hot waters which come from deep underground. The restaurant just across the square served good meals! 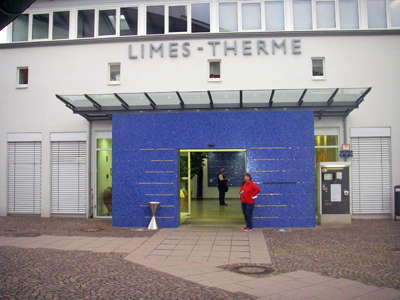 Maria in front of the main building housing the warm water baths. 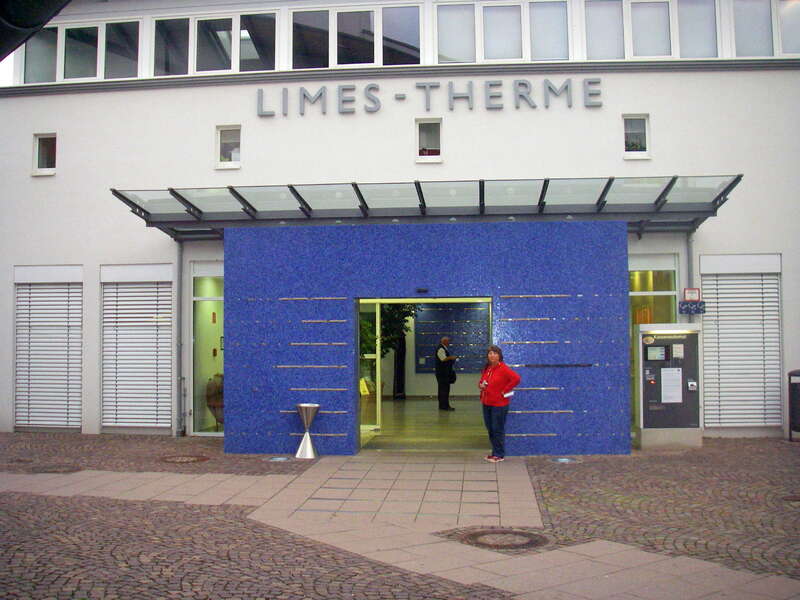 The large spa area has more than 1300 square metres of water surface, and the Roman sauna is meant to be a true copy of an original Limes tower. The Germanic frontier or Limes Germanicus was a line of frontier (limes) fortifications that bounded the ancient Roman provinces of Germania Inferior, Germania Superior and Raetia, dividing the Roman Empire and the unsubdued Germanic tribes from the years 83 to about 260 AD. This aerial photo gives a very good idea of the whole Bad Gögging complex. It is beautifully laid out and maintained. This is a diagram of where the water for the spa and baths comes from, two wells, one more than 400 metres below the surface. Back at the Pension, we counted ourselves lucky to have found such a great place to stay for the night. We dried the tent and our wet clothes on the small balcony. I had a beer, Maria made herself some tea, we watched a little television and chatted to an elderly couple who had been coming to the spa each year for a two week holiday. They were really surprised that we were able to walk in off the street without booking. Once again the day had been full of surprises and had ended well.